They Journey from a Premium to a Mass Market Brand! It’s up to one’s own perception to decide which one more appropriately describes the fact that nearly everything that is sold in retail outlets and company showrooms in Bangalore is being offered at discounted prices. Name it from clothes to jewellery to watches to shoes to mobiles to shades etc has a discount. This has been going on for roughly a month in Bangalore. For quite some time now, Bangalore has been having discounts and offers running during the months of June and July as in South India (or may be even the whole of India) month’s with no festival in it are considered low business months. Our earlier generations believed in buying clothes, watches, jewellery etc during festivals and hence the peak business days were the once preceding the festivals. But now times have changed, and Bangalore has by far been influenced and changed to the greatest extent by westernization and increase in purchasing power among the Indian metros. With the IT boom and the fact that Bangalore is now a cosmopolitan with a huge amount of techies, the purchasing power of the people of the age group of 20-35 has increased considerably in the last decade. I would for one term the Bangaloreans in the age group of 20-28 as “Locomotive Shoppers”. Previous generations believed in Window Shopping, where they would just pass by stores and look at products stocked, on the other hand, Locomotive Shoppers are an extension to Window Shopping where they buy anything that they like (provided it is within their budget) as and when they see it. The product categories that attracts nearly all locomotive shoppers are: Clothes, Shoes, Watches and sometimes even Jewellery. 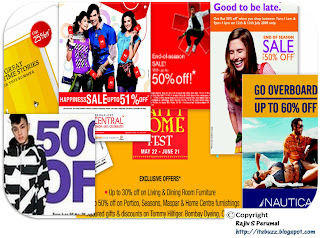 United Colors of Benetton (UCB) offers upto 70% off, Levis offers a flat 50%, Tommy Hilfiger offers upto 50% off, Pepe Jeans offers flat 40% off, name the brand and its on sale. I walked into a mall in Bangalore which has most of these Brands and the crowd in that mall was as though something was being distributed for free. As for the Levis store all I can say is that ‘All Hell Broke Loose”! Say these promotional offers go on for another couple of weeks. What after that? Which sane person would buy a UCB shirt at INR 2500, after having seen UCB offering 70% discount. The premium image of a brand like UCB is surely dented. As for Tommy Hilfiger, I have no words. I doubt people would again ever pay INR 4000 for a shirt from Tommy Hilfiger after seeing them sell it at 50% off. What on earth were the Branding Specialists in these companies thinking?? The premium brand image has come crashing down and hit the floor hard. Everyone did try to increase sales and cash in on increased purchases, but what about the intangible effect of these discounts on the premium brand image??? If they wanted increased sales and offered discounts to reach the masses, then why on earth are they still called Premium Brands? They should rather be in the category of mass market products! but in this so called "recession" period wat other tactics can a brand offer other than discounts to increase sales? Couldn't agree with you more Rajeev!! There would be now difference between Raymonds and UCB if this continues to happen. Once a brand has earned itself a name in the list of the most premium brands, it becomes so easy to loose the same with such thoughtless strategies of offering discounts to the extent of 50%-70%. Good post mate!! One which can draw a lot of arguments rather than discussions. @MJ: Well if you have a premium brand then, guess its obvious that when there is a recessionary trend or drop in the purchasing power, there ought to be a drop in sales.. In any case, when normalcy returns no sane person who wud've spend INR3000 buying a branded shirt and having seen another person wear the same shirt by paying only INR1000 wud ever again buy that brand!!! Moreover the demogrpahic profiles of the two buyers wud be poles apart!! @Kailash: Thanks for your appreciation. N yeah, if this continues who knows your point of view of Raymonds n UCB not having too much of a difference in the minds of consumers may be haunt UCB in the days to come..!! Too many offers just dilute the brand. I would have shopped at UCB but didnt because everyone would ask .. sale mein liya kya? Bzzzzzzz: Harley is in town mate! 'Dreaded Synonyms' - Swine Flue and Influenza A!